In part 4 of the Computer Vision Tutorial Series we will continue with computer vision algorithms for motion. Motion detection works on the basis of frame differencing - meaning comparing how pixels (usually blobs) change location after each frame. There are two ways you can do motion detection. The problem with these motion detection methods is that neither detects very slow moving objects, determined by the sensitivity of the threshold. But if the threshold is too sensitive, it will detect things like shadows and changes in sunlight! The algorithm also cant handle a rotating object - an object that moves, but which has a middle mass that does not change location. By doing motion detection by calculating the motion of the middle mass, you can run more advanced algorithms such as tracking. By doing vector math, and knowing the pixel to distance ratio, one may calculate the displacement, velocity, and acceleration of a moving blob. The major issue with this algorithm is determining the distance to pixel ratio. If your camera is at an angle to the horizon (not looking overhead and pointing straight down), or your camera experiences the lens effect (all cameras do, to some extent), then you need to write a separate algorithm that maps this ratio for a given pixel located at X and Y position. 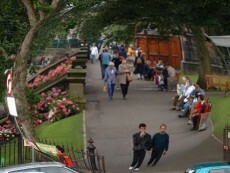 The below image is an exagerated lens effect, with pixels further down the trail equaling a greater distance than the pixels closer to the camera. The variables xd and yd are the image coordinates of the distorted image. The distortion_constant is a constant depending on the distortion of the lens. This constant can either be determined experimentally, or from data sheets of the lens or camera. Cross over is the other major problem. This is when multiple objects cross over each other (ie one blob passes behind another blob) and the algorithm gets confused which blob is which. For an example, here is a video showing the problem. Notice how the algorithm gets confused as the man goes behind the tree, or crosses over another tracked object? The algorithm must remember a decent number of features of each tracked object for crossovers to work. This computer vision method completely ignores and has zero interest in identifying observed objects. It works by analyzing the bulk/individual motion of pixels. It is useful for tracking, 3D analysis, altitude measurement, and velocity measurement. This method has the advantage that it can work with low resolution cameras, while the more simple algorithms require minimal processing power. Ever notice when traveling by plane, the higher you are the slower the ground below you seems to move? For aeriel robots that have a known constant speed, by analyzing pixel velocity from a downward facing camera the altitude can be calculated. The slower the pixels travel, the higher the robot. 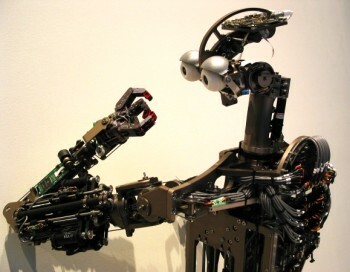 A potential problem however is when your robot rotates in the air, but this can be accounted for by adding additional sensors like gyros and accelerometers. For a robot that is traveling at some known altitude, by analyzing pixel velocity, the robot velocity can be calculated. This is the converse of the altitude measurement method. It is impossible to gather both altitude and velocity data simultaneously using only optical flow, so a second sensor (such as GPS or an altimeter) needs to be used. If however your robot was an RC car, the altitude is already known (probably an inch above the ground). Velocity can then be calculated using optical flow with no other sensors. Optical flow can be used to directly compute time to impact for missles. Optical flow also is a technique often used by insects to gauge flight speed and direction. Please see tracking above, and background subtraction below. The optical flow method of tracking combines both of those methods together. By removing the background, all that needs to be done is analyze the motion of the moving pixels. By analyzing motion of all pixels, it is possible to generate rough 3D measurements of the observed scene. 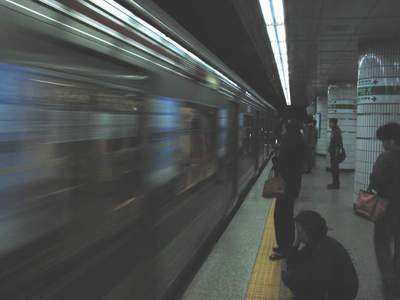 For example, the below image of the subway train: the pixels on the far left are moving fast, and they are both converging and slowing down towards the center of the image. With this information, 3D information of the train can be calculated (including velocity of train, and angle of the track). Problems with optical flow . . . 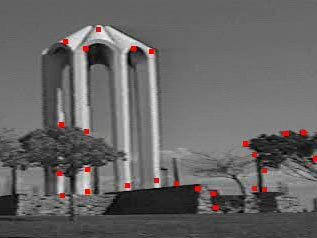 Although it is only rotating about the z-axis, optical flow will say the red bars are moving upwards in the z-axis. Obviously, assumptions need to be made of the expected observed objects for this to work properly. Accounting for multiple objects gets really complicated . . . especially if they cross each other . . .
And lastly, the equations get yet more complicated when you track not just linear motion of pixels, but rotational motion as well. 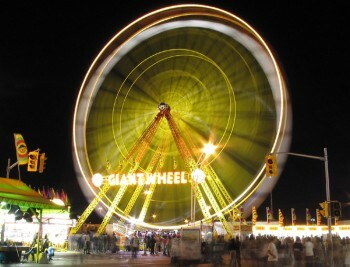 With optical flow, how do you tell if the center point of this ferris wheel is connected to the outer half? The problem with this method as above is that if the object stops moving, then it becomes invisible. If my hand moves, but my body doesnt, all you see is a moving hand. There is also the chance that although something is moving, not all the individual pixels change color because the object is of a uniform color. To correct for this, this algorithm must be combined with other algorithms such as edge detection and blob finding, to make sure all pixels within a moving boundary arent discarded. 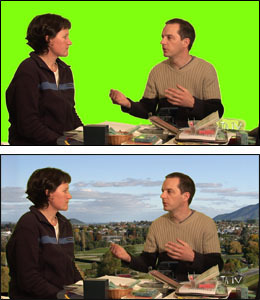 This blue-screening method is more a machine vision technique, as it will not work in everyday situations - only in studios with expert lighting. Here is a video of my ERP that I made using chroma key. If you look carefully, you'll see various chroma key artifacts as I didn't put much effort into getting it perfect. I used Sony Vegas Movie Studio to make the video. A feature is a specific identified point in the image that a tracking algorithm can lock onto and follow through multiple frames. Often features are selected because they are bright/dark spots, edges or corners - depending on the particular tracking algorithm. Template matching is also quite common. What is important is that each feature represents a specific point on the surface of a real object. As a feature is tracked it becomes a series of two-dimensional coordinates that represent the position of the feature across a series of frames. This series is referred to as a track. Once tracks have been created they can be used immediately for 2D motion tracking, or then be used to calculate 3D information. Visual servoing is a method of using video data to determine position data of your robot. For example, your robot sees a door and wants to go through it. Visual servoing will allow the front of your robot to align itself with the door and pass through. If your robot wanted to pick something up, it can use visual servoing to move the arm to that location. 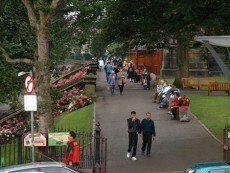 To drive down a road, visual servoing would track the road with respect to the robots heading. To do visual servoing, first you need to use the vision processing methods listed in this tutorial to locate the object. Then your robot needs to decide how to orient itself to reach that location using some type of PID loop - the error being the distance between where the robot wants to be, and where it sees it is. If you would like to learn more about robot arms for use in visual servoing, see my robot arms tutorial. These three below images are made from sonar capable of generating a 2D mapped field of an underwater scene with fish (for fisheries counting). Since the data is stored in a similar way to data from a camera, vision algorithms can be applied. What two different algorithms can acheive the change from scene 1 to scene 2 (hint: scene 2 only shows moving fish)? Name the algorithm that can acheive the change from scene 2 to scene 3 (hint: color is made binary)? What algorithm allows finding the location of the fish in the scene? If in scene two we were to identify the types of fish, what three different algorithms might work? For those interested in vision code for the hacking, here is a great source for computer vision source code. To quickly get started with computer vision processing, try RoboRealm. Its simple GUI interface allows you to do histograms, edge detection, filtering, blob detection, matching, feature tracking, thresholding, transforms and morphs, coloring, and a few others.